In this article you will learn how to Disable / Enable sold Pay-Per-View Tickets as well as editing active Pay-Per-View Tickets by changing Expiry Dates, Total Allowed Views and Allowed Views Per Video. You can also re-send the buyers Confirmation Email, which includes their purchase details such as Ticket Password, Expiry Dates, Allowed Views and a link to the player. If you want to check out some Pay-Per-View Demos and extra information please visit our Pay-Per-View information page. 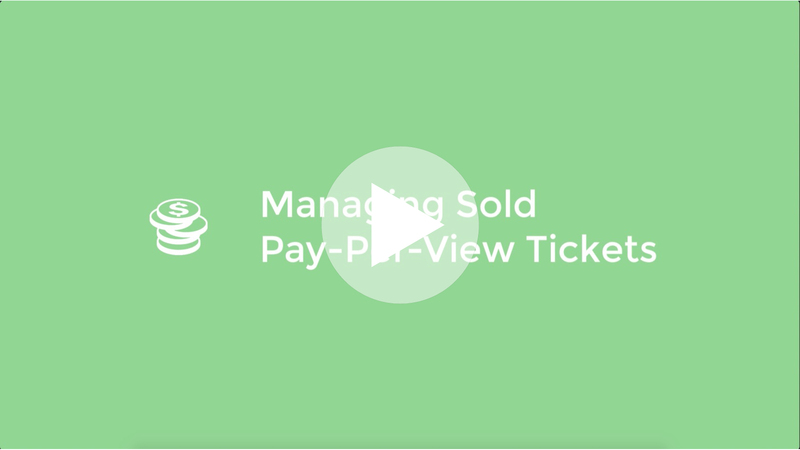 To to manage your sold Pay-Per-View tickets you will need to go to the ⚙️ Settings tab. Here under Setup you will find the Pay-Per-View 🔽 menu. Click on it to expand the sub-sections and select the Sold Tickets Management tab which will display all sold tickets in the centre. Sales Date: The date the ticket was purchased. Password: The currently active password for the purchase. Package: Which Pay-Per-View package the ticket relates to. Ticket: Which Ticket was purchased. Expiry Date: When the ticket will expire. Allowed Views: Total amount of allowed views across all purchased media. Allowed Views Per Video: Total amount of allowed views per video of the purchased media. Enable / Disable: The Check Mark ✅ / Cross ❌ icons allow you to enable or disable the sold Ticket. When a ticket has been disabled the the buyer will no longer be able to access the purchased videos or playlists. Resend Purchase Confirmation Email: The Mail ✉️ icon allows you to resend the Purchase Confirmation email to the buyer. This is useful in some cases where the clients email server deleted the purchase conformation email. Ticket Usage Statistics & Analytics: The Graph 📈 icon will take you to the detailed ticket analytics for the currently selected ticket. To edit a Ticket's expiry parameters please select the ticket you wish to edit from the Tickets Management Panel. On the right hand editing panel you will be able to change and update the parameters. Expiry Period: Here you can when the ticket will expire. You can either set it to Unlimited or a specified expiration date. Allowed Views: Here you can set the Total amount of allowed views across all purchased media. by default it is set to unlimited. When set to limited please enter a number to limit the amount. Allowed Views Per Video: Here you can set the Total amount of allowed views per Video. by default it is set to unlimited. When set to limited please enter a number to limit the amount. To save any changes made o your ticket expiry parameters please click on the 🔁 Update button to save any changes.